Paul Jepson is course director of the MSc in Biodiversity, Conservation and Management and Senior Research Fellow with the Smith School of Enterprise and the Environment. He previously directed the MSc in Nature Society and Environmental Policy (2007-2013) and prior to these appointments, held Senior Research Fellowships with the Environmental Change Institute and the Skoll Centre for Social Entrepreneurship at the Said Business School. Paul transferred into academia from a successful career in conservation management and policy. He has consulted for a wide range of inter-governmental and non-governmental organisations and was Indonesia Programme Coordinator for BirdLife International (1991-1997). He started his career as a local government countryside officer developing new urban conservation initiatives in Manchester and Shrewsbury (UK). His research interests focus on the geographies of conservation governance and focus on three themes: i) theory development to support better conservation practice, ii) the governance of conservation over space and time, and iii) conservation governance futures. This research is informed by long term interests in protected areas, wildlife trade, conservation policy history, science-policy interfaces and NGO, accountability and legitimacy. Paul leads an interdisciplinary Conservation Governance Lab working to generate novel and creative insight to help conservation assure its relevance and impact in the 21st century. The lab's identity is founded on the belief that important applied insights lie at the interfaces of the natural and social sciences and of theory and practice. It aims to generate richer conceptualisations of the actor, policy and management landscape of conservation, how this varies across time and space, and how elements of this might respond to future social, technological and environmental change. A developing research theme of his lab concerns the implications of new technologies and the practices they produce for the future of conservation. More specifically, Paul's current research and writing focuses on three themes i) rewilding and creating the institutional spaces for the development of policy to support functionalist approaches to conservation gain policy support, ii) the implications of new technological forces for conservation science, policy and action, and iii) how to recapitalise conservation and expand the range of financing sources. He has a leading role on two major research initiatives. The first is the development and application of culturomic ('big-data') techniques to generate indexes of the 'culturalness' of species and sites. He has published a series of papers with Richard Ladle and Ricardo Correia that introduce and demonstrate the potential of culturomic techniques. Now their technique is validated, this research is moving to the design and development of new generation conservation decision support techniques. The second project, is investigating ways in which the value - existing and potential- of investments in protected areas can be protected and enhanced. Together with colleagues in the Smith School and Brazil he published a new framework for Protected Area Asset Stewardship in 2017. This project is now researching and developing applied applications of this framework. In addition, Paul is actively engaged in rewilding policy. 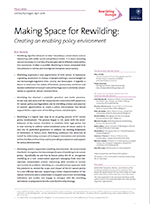 In 2016 he published an agenda for European Rewilding and conducted research with Frans Schepers (Rewilding Europe) on creating a policy space for rewilding within EC nature institutions. He was appointed to the RE board in April 2017. Paul is also active in science communication, particularly in the area of biodiversity science-policy interfaces and new media. He established the Freshwater blog in 2009 and regularly writes for on-line media such as The Conversation and Geographical magazine. Leading development of a framework metrics to assess protected area assets, the forms of value they create and the risks to different asset types. Leader of work-package 4 on Public acceptability of potential genetic solutions to tree health problems. Leader of two components of this multi-partner eco-informatics project which aims to raise the policy profile of FW Biodiversity and develop a stronger evidence-base for policy responses. These are the Dissemination and Communication work package and the development of a climate vulnerability index. In collaboration with Dr Richard Ladle; Fahrul Amama, Burung Indonesia; Made Prana, Indonesian Bird Association; Sujatnika, Aksenta, and Farquhar Stirling, Nielsen Indonesia; Financial support from Darwin Initiative; (2005-2008). In collaboration with Dr Alex Nicholls and Alec Jacobs, Skoll Centre for Social Entrepreneurship, Saïd Business School; Financial support from University RDC. Completed MPhil in 2015 Place, agency and policy: Does the one size of India's Mahatma Gandhi National Rural Employment Guarantee Act really fit all? Completed MPhil in 2010 Towards a blended governance approach for forest biodiversity conservation in Indonesia. If you lack access to journals and would like to read any of the articles below please follow Paul on ResearchGate or contact him directly for a reprint. For a full list of Paul's publications please see ResearchGate. Jepson, P. (2018) Recoverable Earth: a twenty-first century environmental narrative. Ambio. Correia, R., Jepson, P., Malhado, A. and Ladle, R. (2017) Internet scientific name frequency as an indicator of cultural salience of biodiversity. Ecological Indicators, 78: 549-555. Correia, R.A., Jepson, P., Malhado, A.C.M. and Ladle, R.J. (2017) Culturomic assessment of Brazilian protected areas: Exploring a novel index of protected area visibility. Ecological Indicators, 85: 165-171. Hoffmann, C.F., Montgomery, R.A. and Jepson, P.R. (2017) Examining the Effect of Billboards in Shaping the Great Wolf Debate of the American West. Human Dimensions of Wildlife, 22(3): 267-281. Jepson, P. (2017) Photography is transforming British birdwatching. British Birds, 10: 426-429. Jepson, P. and Arakelyan, I. (2017) Developing publicly acceptable tree health policy: public perceptions of tree-breeding solutions to ash dieback among interested publics in the UK. Forest Policy and Economics, 80: 167-177. Jepson, P., Caldecott, B., Schmitt, S.F., Carvalho, S.H.C., Correia, R.A., Gamarra, N., Bragagnolo, C., Malhado, A.C.M. and Ladle, R.J. (2017) Protected area asset stewardship. Biological Conservation, 212: 183-190. Ladle, R., Jepson, P., Correia, R.A., and Malhado, A.C.M. (2017) The power and the promise of culturomics. The Ecological Society of America: Frontiers in Ecology and the environment, 15(6): 290-291. Mulyani, M. and Jepson, P. (2017) Does the ‘One Map Initiative’ Represent a New Path for Forest Mapping in Indonesia? Assessing the Contribution of the REDD+ Initiative in Effecting Forest Governance Reform. Forests, 8(1). Bragagnolo, C., Malhado, A.C.M., Jepson, P. and Ladle, R.J. (2016) Modelling local attitudes to protected areas in developing countries. Conservation and Society, 14(3): 163-182. Correia, R.A., Jepson, P.R., Malhado, A.C.M. and Ladle, R.J. (2016) Familiarity breeds content: assessing bird species popularity with culturomics. PeerJ. Correia, R.A., Malhado, A.C.M., Lins, L., Gamarra, N.C., Bonfim, W.A.G., Valencia-Aguilar, A., Bragagnolo, C., Jepson, P. and Ladle, R.J. (2016) The scientific value of Amazonian protected areas. Biodiversity and Conservation, 25(8): 1503-1513. Jepson, P.R. (2016) Saving a species threatened by trade: a network study of Bali starling Leucopsar rothschildi conservation. Oryx, 50(3): 480-488. Ladle, R.J., Correia, R.A., Do, Y., Joo, G-E., Malhado, A.C.M., Proulx, R., Roberge, J-M. and Jepson, P. (2016) Conservation culturomics. Frontiers in Ecology and the Environment, 14(5): 269-275. (Download PDF 827KB). Schepers, F. and Jepson, P. (2016) Rewilding in a European Context. International Journal of Wilderness, 22: 25-30. August, T., Harvey, M., Lightfoot, P., Kilbey, D., Papadopoulos, T. and Jepson, P. (2015) Emerging technologies for biological recording. Biological Journal of the Linnean Society, 115(3): 731-749. Buckingham, K. and Jepson, P. (2015) The legitimacy of bamboo certification: Unpacking the controversy and the implications for a "treelike" grass. Society and Natural Resources, 28(6): 575-592. Jepson, P. and Ladle, R.J. (2015) Nature apps: Waiting for the revolution. Ambio, 44(8): 827-832. Jepson, P.J. (2015) A rewilding agenda for Europe: creating a network of dynamic and experimental reserves. Ecography, 39(2): 99-252. (Download PDF 839KB © Wiley). Mulyani, M. and Jepson, P. (2015) Social learning through a REDD+ 'village agreement': Insights from the KFCP in Indonesia. Asia Pacific Viewpoint, 56(1): 79-95. Buckingham, K.C. and Jepson, P. (2014) Whose sustainability counts? Reflections on an Indian oasis and the drive for certified bamboo. Asian Geographer, 31(2): 97-112. Jepson, P. (2014) Considering animal welfare in species conservation. BioScience, 64(12): 1191-1192. Buckingham, K. and Jepson, P. (2013) Forest certification with Chinese characteristics: state engagement with non-state market-driven governance. Eurasian Geography and Economics, 54(3): 280-299. Buckingham, K.C., David, J.N.W. and Jepson, P. (2013) Diplomats and refugees: panda diplomacy, soft "cuddly" power and the new trajectory in panda conservation. Environmental Practice, 15(3): 262-270. Gillison, A.N., Bignell, D.E., Brewer, K.R.W., Fernandes, E.C.M., Jones, D.T., Sheil, D., Watt, A.D., Constantino, R., Couto, E.G., Hairiah, K., Jepson, P., Kartono, A.P., Maryanto, I., Neto, G.G., Noordwijk, M., Silveira, E.A., Susilo, F.X., Vosti, S.A. and Nunes, P.C. (2013) Plant functional types and traits as biodiversity indicators for tropical forests: two biogeographically separated case studies including birds, mammals and termites. Biodiversity and Conservation, 22(9): 1909-1930. Jepson, P. and Jennings, S. (2013) Should the wildlife media pay for conservation? A response to Wunder and Sheil. Oryx, 47(4): 486-487. (Download PDF 489KB © Cambridge University Press). Ladle, R.J., Bragagnolo, C., Gama, G.M., Malhado, A.C.M., Root-Bernstein, M. and Jepson, P. (2013) Private protected areas - three key challenges. Environmental Conservation, 41(3): 239-240. Mulyani, M. and Jepson, P. (2013) REDD+ and forest governance in Indonesia: a multistakeholder study of perceived challenges and opportunities. Journal of Environment and Development, 22(3): 261-283. Jepson, P. (2017) Nature conservation. In, Richardson, D., Castree, N., Goodchild, M.F., Kobayashi, A., Liu, W. and Marston, R.A. (eds.) International Encyclopedia of Geography: People, the Earth, Environment and Technology. Wiley. 8464 pp. ISBN: 978-0-470-65963-2. Jepson, P. (2013) Back from the brink transformed. Musing on Bali starling conservation. In, Aldhous, C. (ed.) Ghosts of Gone Birds. Resurrecting lost birds through art. Bloomsbury Publishing, London. Jepson, P. (2013) Biodiversity conservation. In, Warf, B. (ed.) Oxford Bibliographies: Geography. Oxford University Press, New York. Correia, R.A., Jaric, I., Jepson, P., Malhado, A.C.M., Alves, J.A. and Ladle, R. (2018) Nomenclature instability in species culturomic assessments: Why synonyms matter. Ecological Indicators. Jepson, P., Caldecott, B.L., Milligan, H. and Chen, D. (2015) A framework for protected area asset management. Smith School of Enterprise and the Environment, University of Oxford, Oxford, UK. Jepson, P. (2017) Wild meat: rewilding and hunting. Geographical magazine. Jepson, P. (2016) The changing face of birdwatching. Geographical magazine. Jepson, P. and Schepers, F. (2016) Making Space for Rewilding: Creating an enabling policy environment. Policy Brief. Caldecott, B. and Jepson, P. (2014) Towards a framework for Protected Area asset management. SSEE. Jepson, P. (2011) Bird playback - reflections on audio technology and birding practices. Sanctuary Asia, 31(1): 38-43. Jepson, P. and St.John, R. (2011) Going with the flow. Special feature: Freshwater Ecology: The BioFresh Programme. Public Service Review: European Science and Technology, 13: 134-137. Jepson, P. (2014) Five ways to stop the world's wildlife vanishing. The Conversation. Jepson, P. (2013) Ending songbird slaughter? There's an app for that. The Conversation. Jepson, P. and S. Canney (2003) The state of Asian Elephant Conservation in 2003. Elephant Family, London. Jepson, P. and Schmitt, S. (2001) Naturdenkmal: a site protection concept worth revisiting? British Wildlife, 12(5): 312-315. Video: Water Lives 2014: science-policy interface. Produced by Helen Scales, Ria Mishaal and Paul Jepson.